The Shimano Deore LX has evolved from an MTB to a trekking components group. The engineers not only created lightweight components: a lot of attention was paid to designing a group set with good looks and performance for even more enjoyment of cycling. The Deore LX after-market set comes in luxurious packaging. 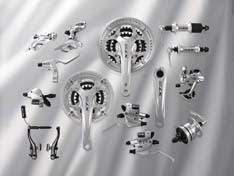 Two of the main characteristics of the Deore LX trekking components are reliability and durability. The new LX group has no complicated gimmicks to distract the rider’s attention. The design of the Rapidfire Plus shifters with 2-Way Release technology is aimed at easy operation and smooth and effortless shifting. A clear optical gear display tells the gear the rider is in and that’s all he or she needs to know. The brakes also function according to this riding style: easy function, good controllability and of course sufficient stopping power.